Personalised Christmas jimjams for infants in festive red and green top and bottom set. Personalised Christmas jimjams for infants in festive red and green top and bottom set. Toddlers look adorable in these Christmas coloured pajamas. Comfy all cotton jersey fabric. 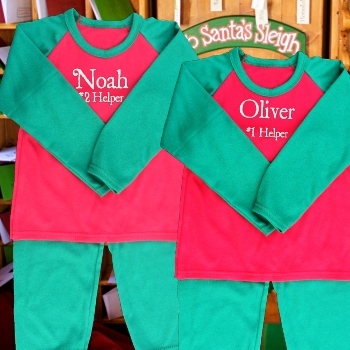 Personalised Christmas jimjams for infants in festive red and green top and bottom set. Toddlers look adorable in these Christmas coloured pajamas. Comfy all cotton jersey fabric. The PJ top is embroidered with a personalised name or message of your choice! Create your own message for Santa's little helper. Embroidered text is in xmas font and white thread. Select the size you require. This jammie set is also great for children to dress up - add your own novelty hat and you have an instant elf outfit! Size: 1-2yrs, 2-3yrs, 3-4yrs, 4-5yrs, 5-6yrs.